SAN FRANCISCO: Last summer, I packed up the family in a Nissan Quest for a vacation to Chicago. The neat thing about the trip was that our daughter was happy in the back, watching Snow White and Anastasia on the vehicle's TV and video player. But after 10 days in the Quest, we found some problems, including the entertainment system that fit between the front bucket seats. The entertainment console just seemed like it was always in the way and took up too much space. 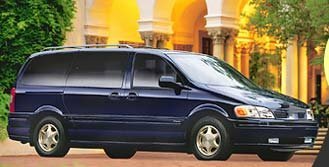 After driving the 2000 Oldsmobile Silhouette Premiere, I now know that this minivan is the one for any long trips with Haylee or any other screaming kid. The Silhouette's TV screen flips down from the ceiling, and the video player is tucked away under the front dash. A remote control and rear volume controls allows rear seat passengers to handle all the entertainment responsibilities. It's just a more convenient and low profile system than the Quest's. I didn't take the Silhouette anywhere special, but Haylee did watch a few cartoons on the way to school this past week. So, instead of Haylee playing Punch Bug with me, I listened to Timon and Pumbaa, while she sat quietly in the rear bench seat. This leads me to another positive aspect of the Silhouette's ceiling-mounted screen, and its the first minivan to offer a factory-installed integrated video system. In the Quest, the view wasn't always clear from the rear seat. In the Olds, everyone could see the screen from even the back of the van. The Silhouette has been around for about 10 years now, and for 2000, there are a lot of changes. Olds dropped the short wheelbase version of the minivan, keeping the 120-inch model with its 201.4-inch overall length. Compared to the Quest, the Silhouette's wheelbase is almost 8 inches longer and the overall length is about 6 inch longer. This equates into more leg room for middle-seat passengers and way more total cargo space  155.9 cubic feet compared to the Quest's 111.3 cubic feet. This was another reason why we felt less cramped in the Silhouette, and we would have had plenty of room for any over packing. The 2000 Silhouette also gets an upgraded traction control system, a redesigned instrument panel and an improved radio with Radio Data System (RDS) features. Later on this year, Olds is reportedly adding the OnStar system as standard equipment. And we just loved the power sliding door on the passenger side. The Silhouette is powered by a 3.4-liter 185-horsepower V6. Although the Quest's 3.3-liter 170-hp V6 handled the mountains pretty well last year, I believe the Nissan could have done better. In the Silhouette I felt a surge of power every time I got behind the wheel of the Olds. Had I not remembered that I was in a minivan, I could have almost sworn I was driving the peppy little Alero. Column Name: "An Entertainment Center on Wheels"